Pink slime? No. Beige mash with skin? Yep! Remember pink slime? 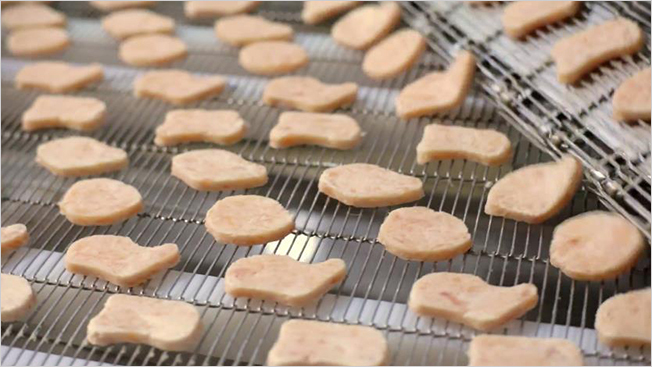 McDonald's Canada continues its crusade for McFood transparency with a new video aimed at proving Chicken McNuggets are not made from the pastel meat goop seen in a frequently shared image from the Internet. By taking viewers on a tour of the chain's meat supplier, Cargill, the video shows in some detail that, instead of pink slime (processed beef trimmings disinfected with ammonia), chicken nuggets are actually made of chicken breasts mixed with seasoning and skin. The result is a mix that looks a lot more like ground chicken than you might expect (until it's molded into the four cutesy shapes — "the ball, the bell, the boot, and the bow-tie"). In other words, it's not pink slime. It's beige mash. As for what seasoning actually goes into the nuggets recipe, HuffPo has the details. When the pink slime controversy erupted in 2012, McDonald's U.S. claimed it had stopped using pink slime in its burgers in 2011, and McD's Canada denied ever having included the dubious ingredient in its food. Nonetheless, the brand felt compelled to clear the air, given the frequent misconception among consumers. The Q&A format is now a familiar one for the brand's Canadian operation, though this clip does test the limits of how transparent the company can be without making things too unappetizing. Brad Tuttle at Time is calling it "a smart, necessary step for McDonald's." Taylor Berman at Gawker thinks "it's still sort of disgusting." While it definitely doesn't sugar-coat the fact that the golden arches are serving up heavily processed food, at least now you'll know what goes into that process.